"Free Trade Agreements: A Successful Strategy for RCEP?" 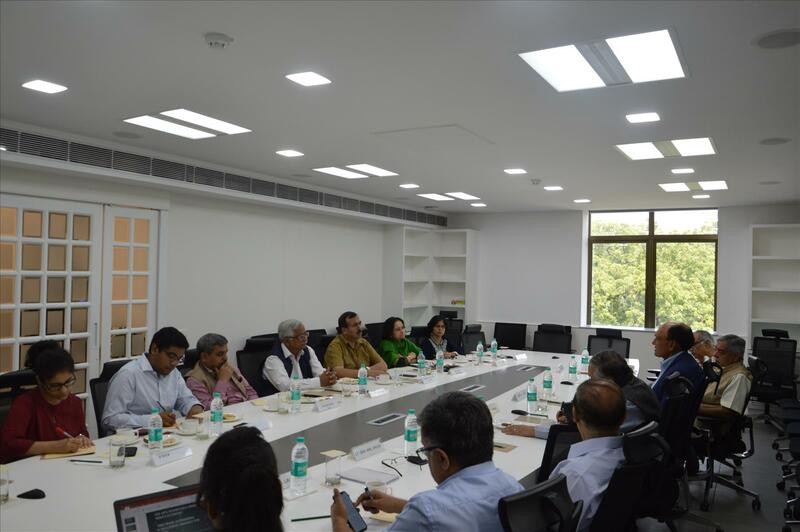 The Delhi Policy Group (DPG) and the Society for Development Studies (SDS), organized a Roundtable discussion entitled: “Free Trade Agreements: A Successful Strategy for RCEP ”, from 1030-1300 hrs. on October 4 , 2018. 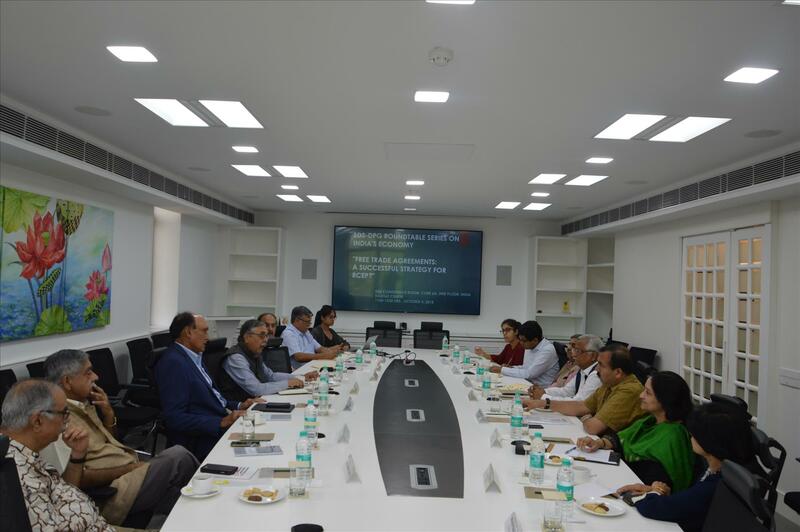 Discussions at the roundtable were moderated by Dr. A. Didar Singh, I.A.S. (Retd. ), Senior Fellow, DPG. Dr. Arpita Mukherjee, Professor, ICRIER and Ambassador Jayant Dasgupta, former Indian Ambassador to the WTO, led off the discussion. Shri Sudhanshu Pandey, Additional Secretary, Trade Policy Division, Ministry of Commerce and Industry, gave the government perspective and shared the current status of progress on RCEP. Ambassador Hemant Krishan Singh, Director General, DPG/SDS, while welcoming the participants, placed the discussions in their historical perspective and also shared the geo-economic context which the Indian trade negotiators should seize to strike deals in the country’s long term strategic interest. Dr. A. Didar Singh made a PowerPoint presentation (attached), laying out the existing FTAs of India and placing RCEP in the context of Asia. He concluded that with TPP converting to CPTPP and also the ‘US-China trade-war’ escalating further, India needs to be a major player in the trade scenario and be seen as a good location for businesses looking for alternatives to China. Ambassador Jayant Dasgupta made a detailed presentation on RCEP and pointed out that ASEAN countries want RCEP to be an improvement over existing FTAs. He also opined that in the 120-odd Services sub-sectors, India’s interest appears to be mainly in IT and mobility of human resources. Since India appears not to have gained significantly from existing FTAs it wants to ensure that with RCEP, investment and services negotiations and deals must run parallel to those on goods. Dr. Arpita Mukherjee (ICRIER) pointed out the lack of substantial trade policy research especially in the context of RCEP, and also the problem of insufficient data. She noted that the concerns of industry about FTAs arise from poor understanding about their nature, as also the slow pace of institutional reform and infrastructure development in the Indian economy. Shri Sudhanshu Pandey, Additional Secretary Trade Policy Division, placed the entire discussion in the prevailing global geo-economic setting and also shared the present status of the RCEP negotiations. Greater market access is important for India and all FTAs must be seen in this context. Remaining part of RCEP rule making is also in India’s interest. Overall, the discussions were spirited and the experts present agreed that India has been at the forefront of promoting a rule based global trading system but has at the same time been open to trade agreements, particularly in its immediate region and East Asia. RCEP is a major ASEAN-led initiative correlated to India’s evolving Act East policy and the country must benefit from its several advantages.